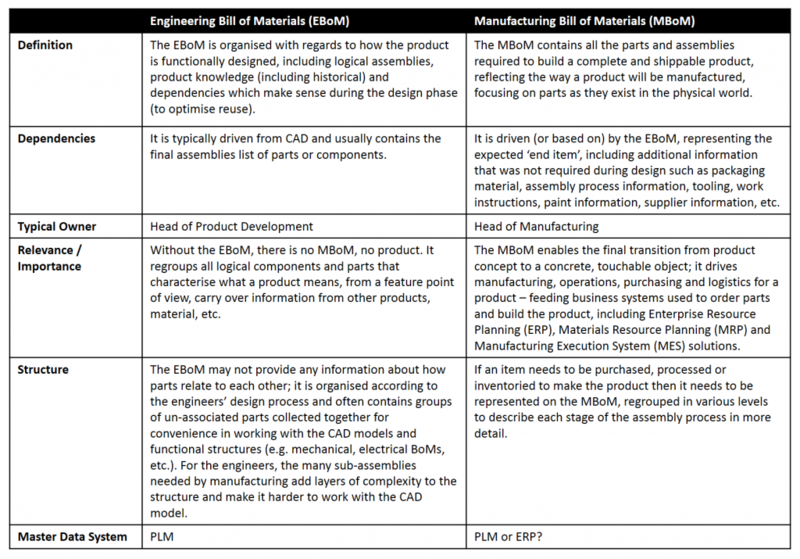 A Bill of Materials (BoM) is often compared to a recipe – both identify and list the components of a finished product. While the recipe identifies the required ingredients, preparation steps and presentation recommendations, in manufacturing terms the BoM identifies and lists all raw materials, sub-assemblies, with layers of data that are interrelated, including even intangibles that contribute to the costs of manufacturing a product. Like recipes, there are different types of BoM based on their usage, complexity, accuracy, levels of detail, etc. ; critical aspects of product creation rely essentially on Engineering and Manufacturing BoMs and how they interlock in context of the Product Life-cycle Management (PLM). Producing products with a wrong or faulty component in an EBoM is not so easily resolved. Last minute root cause analysis and rework on a live production line or a mature product component can be very costly. The earlier BoM issues are identified and addressed, the lower the cost impact on product Engineering and Manufacturing. BoM synchronisation issues, e.g. with Engineering issues leading to Manufacturing issues, or Manufacturing issues requiring both costly Engineering and Manufacturing changes (shop floor process, manufacturing process, material, supplier data, etc.). Costly and inaccurate manual interventions to resolve issues – leading to potential compliance issues, additional BoM ‘admin‘ branching and overarching ‘admin‘. Inaccurate inventory levels, supplier cost issues. Incorrect product costing and potential accounting variances (ie negative cash flows due to overspends or inaccurate financial forecast and budgeting). Warranty issues and customer returns or recalls, with potential commercial liability claims and leading to potential brand perception issues. There are different schools of thought with regards to EBoM and MBoM alignment. Synchronising and maintaining EBoM and MBoM alignment requires a lot of preparation, as what is managed on the Engineering side differs significantly from the Manufacturing side (approach, usage, life-cycle, dependencies, etc. ); the two need constant alignment and maintenance to ensure seamless business continuity (…). This post was originally published on LinkedIn on 17 August 2015.